Bellamy moved to the Charlottesville area in 2009 to work for the National Ground Intelligence Center. He left that position shortly afterwards and began teaching in Albemarle schools. He established the Helping Young People Evolve in 2011 and soon afterwards entered city politics. Bellamy announced his candidacy on March 13, 2013 at Tonsler Park. Just a month before, he had declared he would not run this year, but changed his mind. He is originally from Atlanta, and moved to the area to take a job at the National Ground Intelligence Center. Soon after election, Governor Terry McAuliffe appointed him to the State Board of Election. ↑ Web. Charlottesville City Council meeting minutes, .pdf, Council Chambers, City of Charlottesville, January 4, 2016. ↑ Web. Dozen: Bellamy helping city's poorest children reach potential, Aaron Richardson, Daily Progress, World Media Enterprises, December 27, 2013, retrieved January 7, 2016. ↑ Web. Bellamy announces Council candidacy, Sean Tubbs, Charlottesville Tomorrow, March 13, 2013, retrieved March 14, 2013. ↑ 7.0 7.1 Web. It's official: Fenwick to be on ballot for City Council, K. Burnell Evans and Aaron Richardson, Daily Progress, World Media Enterprises, June 14, 2013, retrieved June 19, 2013. ↑ Web. Szakos makes bid for second Council term official, Sean Tubbs, Charlottesville Tomorrow, February 14, 2013, retrieved March 14, 2013. ↑ Web. [ Questionnaire for City Council Candidatesurl=http://www.pharcville.org/2013/06/04/phar-questionnaire-for-city-council-candidates/], June 4, 2013, retrieved June 10, 2013. ↑ 12.0 12.1 Web. 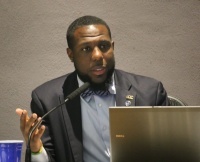 Bellamy enters race for Charlottesville City Council, Lacey Naff, Charlottesville Tomorrow, February 15, 2015, retrieved February 17, 2015. ↑ Web. Homophobic, sexist, anti-white language abundant in Charlottesville vice mayor's tweets, Anna Higgins and Tim Dodson, News Article, Cavalier Daily, November 28, 2016, retrieved December 27, 2016. This page was last edited on 29 March 2019, at 12:29.